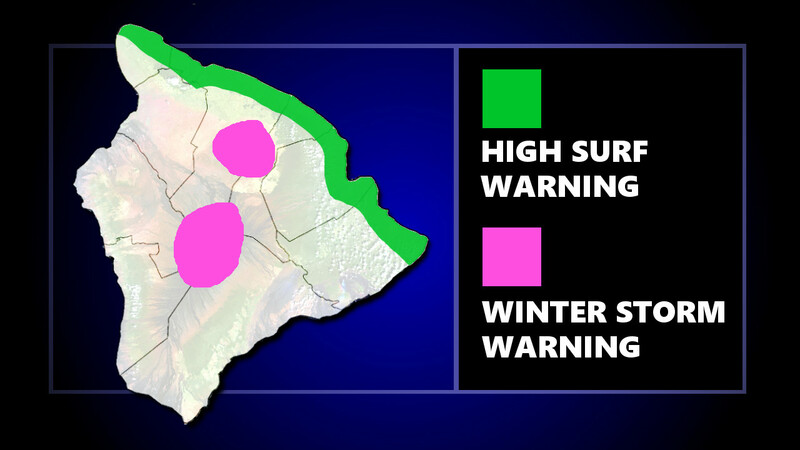 HAWAIʻI ISLAND - Surf over 20 feet is possible along east facing shores this morning, and a Winter Storm Warning is in effect for the summits. Audio message from Hawaiʻi County Civil Defense, issued Feb. 13, 2019. (BIVN) – The National Weather Service continues the High Surf Warning for east facing shores of Hawaiʻi Island, and has issued a Winter Storm Warning for the summits of Mauna Kea and Mauna Loa. Hawaiʻi County Beach Parks from Keokea through Laupahoehoe to Richardson Beach Park are closed today, a civil defense message announced Wednesday morning. Hilo Bayfront Highway is also closed. Surf heights will be 18 to 22 feet today, lowering to 14 to 18 feet Thursday, forecasters say. Power restoration continues in Hāmākua. Highway 19 between the 38 and 39 mile markers will be restricted to a single lane of traffic from 7 a.m. to 10 p.m. today to facilitate repairs. However, civil defense reports that Honokaʻa Schools are open today.